Freedom Surf Shop has been a mainstay of the Virginia Beach surf community since 2005. 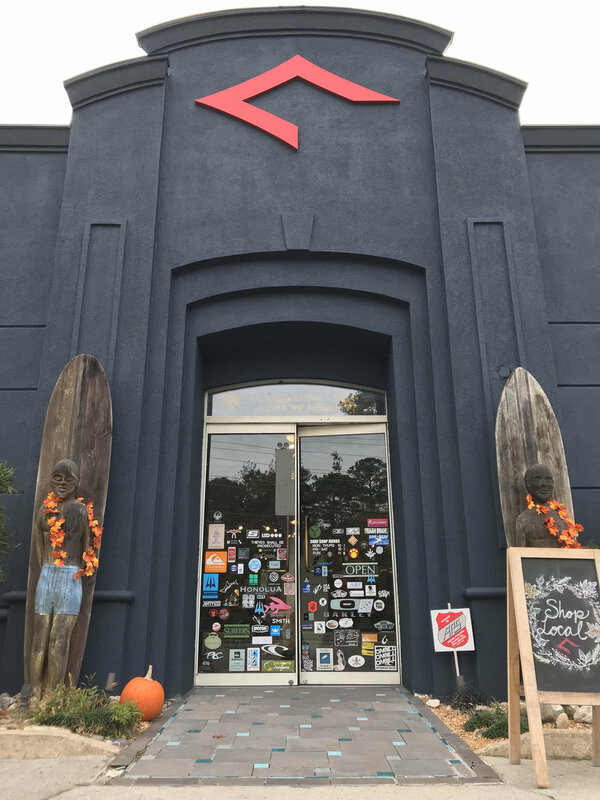 Upon entering our doors strangers become friends over long talks about the latest shortboard, longboard, SUP or wetsuit design and on our blog the conversation continues. A window campaign that was initiated and painted with love! A date in the middle of February that celebrates this amazing emotion. As a surfer, love comes in many forms. From the first stroke of wax on a new board, to watching your child flying down the face of a wave . Love has been occupying our thoughts lately at Freedom Surf and this post hopefully will fill you in on what we are loving!!! Change! During the fall months of 2018, we changed the exterior color of the store, the stores layout and the product mix that we carry. 2019 will see more changes to the inside of the store, as we evolve the experience to new levels.. LOVE THIS! New Brands! 2019 will see a plethora of new brands hitting our shop. Fashion meets surf, in what will be a saltwater melody that will truly inspire. LOVE THIS! Surfboards! Shapes are continually being refined as is technology. Freedom Surf has been the leader in getting the goods under your feet and this year we will not let you down! We have several new brands hitting our racks this for 2019 and yes, we LOVE THIS! As we continue to evolve and embrace this lovely little month of February! Know that what we do in the shop is for you. And yes we LOVE THIS! support local . . .
Last Sunday, following a super fun day of surf and a few post session coldies. I came upon a post that the Sunday crew had created. It was the night before, “Cyber Monday” and the crew had reposted the most epic picture of the legendary Pete Smith offering the two finger salute to the internet and more so directed at Cyber Monday. Epic! I commented on the post! F$@! AMAZON / F$@! VENDORS THAT CHOOSE TO COMPETE AGAINST US! & MOST OF ALL F$@! CYBER MONDAY! Right away, I started receiving messages and texts from friends that loved the comment! But one comment, totally got me. Why are you so angry? With that, my rant was taken down. Over the last few days, I realized that I was angry. I regretted taken the comments down! As we enter into a magical time of year, that should be filled with joy and stoke, we will be faced with that large guerilla in the room! With that, I once again will repeat the above Mantra: F$@! AMAZON / F$@! VENDORS THAT CHOOSE TO COMPETE AGAINST US! & MOST OF ALL F$@! CYBER MONDAY. Support local this Holiday Season! BRING A FRIEND / TELL A FRIEND . . . In several months we will be celebrating our surf shop’s 14th year Anniversary! I know, who celebrates 14 years? Well we do and will ( hang tight on the party invite, as it will be a good one…). By the time that we have gotten to that date, we will have sold 6,300 surfboards, 2,800 standups, 12,600 bars of wax and all of the other goods that you have needed to travel down your path of a surfer. We also would have made thousands of friends, offered countless advice and offered up way too many random/free surfboard fins, fin screws, wax etc. So we are changing! Not locations, not the name or any of the goodness that you love. We are changing our lineup! From a major redo inside the shop, to new colors and feel on the exterior. New brands are gracing our lineup and that will continue to evolve into a experience that is unlike any on the retail front. Why are we telling you all of this? Well, it’s simple. Because we need you!!! This is what we need. . .
For the next six weeks, we would love to have you either bring a friend (that has never been in the shop) into the shop or tell a friend about Freedom Surf! That’s it! As simple as that…. SURFBOARDS! 2018 we reinvested in our past. Known for the best selection of logs, fish, eggs and alternative equipment on the East Coast ~ we humbly acknowledge that our selections were a bit stale over the last few years. This is why we have stepped it up once again, with over 250 new boards in the racks! These aren't your clear sanded shortboards , nope, they are crafts that scream for new lines and approaches on the wave. Come on in and have a look for yourself! SUPS! We're working hard to understand where this sport is heading. A decade ago it was our fastest growing department in the store! Rivaling our surfboard business, we were one of the early pioneers that ventured into Race Shapes, surfing specific shapes and a slew of unique all rounders. All complimented by events that we sponsored/or put on and weekly meetups! Fast forward to 2018, the few local sup races are lucky to have twenty paddlers turn out. Inexpensive, heavy, poorly designed boards are littered at most sporting good stores only to find questionable enjoyment in the water. Participation is dropping! With that said, we still love to paddle and still sell stand ups. Just would love your feedback! Feel free to respond and let us know your thoughts! Gear! Both in the Girls and Guys department, excitement is in the house. Striving to offer different brands then what are down the street at the other shops (and on the racks at the discounters) we have been working diligently over the last year to revive and refresh our offerings! If you haven't been in the shop this year, what are you waiting for? Summer is about FREEDOM! Freedom to enjoy long hot days on the beach. The freedom to ride multiple surfboards in a afternoon. The freedom to put all of the stress that life throws at you, on the back burner and cleanse your soul in the water. At Freedom Surf, we have worked very hard to offer you all of the toys and gear that you will need to have the most amazing summer! Feel free to post any comments to this blog! Master surfboard shapers don't come around all to often. We are thrilled with the addition of Michel Junod surfboards to our boardroom assortment. From the days of strictly 9 1/2 foot surfboards, Michel has been through the shaping roll coaster for over 50 years. Known for single-fin logs, quad fishes, and performance shapes he has successfully carved a career in surfboard manufacturing where he resides in Santa Cruz, CA. In 2007 he was featured in Thomas Campbells film 'The Present' where he strolled across Western Africa with rippers like Al Knost & Dave Rastavich. Michel and Thomas have collaborated on surfboard design ever since and his art work can be found on all of his recent boards. A true pioneer of the "ride everything" movement. Heres what we have on our racks! USA TODAY came through the shop just about a month ago to interview the ambassador of stoke Pete Smith about our unique surf history here in Virginia Beach. Our shops short 13 year history has shown no shortage of selling the best surf craft east of the Mississippi. This Spring we are carrying on the tradition with the newest addition to our board room CJ Nelson Designs! CJ is one of our generations iconic surfers most known for his advanced nose riding and STYLE. Being featured in modern classic surf flicks like Sprout, The Present, and many other epic parts have showcased his amazing talents. With a new perspective on surfing as well as surfboard design over the past years he has collaborated with some of the best shapers and experimented thoroughly with new materials to progress not only his craft, but for all surfers who share the same perspective. Recently CJ took the win at Mexi Log festival & won his first Joel Tudor Duct Tape Invitational in La Saladita, Mexico on his newest model The Guerrero. For more stories behind the shapes feel free to visit - https://cjnelsondesigns.com. We'll have a full range of boards from CJ Nelson Designs in collaborations with Ian Chisholm, Corey Colapinto, and Eden Saul for 2018. We are stoked to be one of few dealers on the East Coast | For any questions feel free to pop by the shop OR give us a ring at (757) 491-0266! Justin Quintal x Black Rose MFG. With a few weeks of late hurricane activity severely impacting our beloved east coast + a fiery presidential race, we have all been stuck in a weird place! Take a breather and watch shop amigo Justin Quintal make the best of late September sessions at his home in Jacksonville, FL on a few personal Black Rose MFG. boards! Shout out to all families and local businesses affected by Hurricane Matthew. Hope all is well! Some may know, and some may not. Simon Anderson reshaped surfing for for the generations to come by introducing the modern day thruster on what was then the most sizable / perfect right point anyone has seen on tour at Bells Beach in 1981. With ease and powerfulness, Simon demonstrated what was capable on a thruster. Since then 8,197,342 three fin thrusters have been built around the globe and 33 world titles have been won using a thruster. We have a lot to thank Simon Anderson, and we are stoked to carry a variety of models in the shop! Get yours TODAY! This Friday we'll have one of our favorite SUP models, the Whopper by Starboard, coming back into stock. The Whopper is the perfect all around shape, with enough beef to float an adult and child or the biggest member of your family, and the dimensions to handle a fun day paddling flatwater or in the surf. A great video shot by the talented Jordan Montgomery featuring Freedom Team Riders Josh Carolina, Wesley Francis and Leif Jones. With all the buzz around Tomo and Kelly Slater's collaborations some of Firewire's other fresh-for-2016 shapes have flown under the radar including one we've been riding and absolutely stoked on, the Almond Butter by Rob Machado. In this video Rob shows off what the shape is capable of and talks about some of its design features. Starboard in partnership with Go Foil has developed a SUP specific foil that will be hitting the shop and the water later this summer. World famous graphic designer David Carson talks life, work and surf in this little bio. If you've never heard of the man or seen footage of Kane Garden then this one's a must watch. Sunova SUP Demo Boards Available for the Next 10 Days!!! We figured we would wet your appetite with this review of the Sunova Speeed SUP model before urging you to come in and demo a Sunova or 3 at some point over the next week or two. The SUP surf community has been stoked on the way these boards have performed and now you can see what all the fuss is about all you have to do is bring a valid driver's license and credit card (which won't get run unless you disappear on us), fill out some paperwork and go paddle - what could be easier? After eyeing this model for a couple of years we finally have it in! The Mini-Howard is a versatile 2+1 egg that will work in just about anything - big, small, blown out or perfect, and inject a ton of soul into your surfing. Check out Devon Howard (the model's namesake) riding his and then swing by the shop to feel ours up. In 1978 Eddie Aikau jumped on his surfboard and paddled away from the capsized Hokule'a on a mission to find help. The crew of the Hokule'a was later rescued, but Aikau was never seen again. So begins the most famous (for surfers at least) chapter of the Hokule'a, a traditional sailing canoe built in the 70's to rediscover and recreate a sense of what was possible for the Ancient Polynesians. Today the Hokule'a is sailing again and currently finds itself in the 2nd half of a worldwide voyage that began in 2013 and is expected to conclude next year, and one of the stops and that voyage is Hampton Roads. Slated to arrive today (Friday, April 22nd) at the James River Fishing Pier in Newport News where it will spend 24hrs before heading to the Riverwalk Landing Marina in Yorktown for close to 2 weeks. During that period a series of special events with the crew of the Hokule'a will be held at the Mariner's Museum. Check out the Hokule'a's website fore more info about all of the exciting events to come, and check out this video on the Hokule'a for a better idea of how amazing this ship and voyage are.